I realize this is probably a heroic Deathwing item and not a lot of people are gonna have this, but this is just gonna be insane in PvP. 517 agility would already make it best in slot on its own, but that proc can take off over 10% of someone's health on top of the damage that's already going out. That's a pretty insane number; I don't think there's ever been a trinket proc that could take off that much of a player's health. We don't know how it works yet, but if it runs off of a PPM mechanic like most other trinkets that proc damage (see here), that means you could even get back to back (or even back to back to back) procs from this thing. If it has an ICD, that means players could track the cooldown with addons and set up essentially guaranteed burst when it's ready. Edit: Apparently, this trinket is being reduced by armor. But the reverse is happening as well: it's also being increased by physical damage modifiers and attack power. This means it's going to hit for even more than the tooltip says, even after factoring in armor reduction. Edit2: Item level is now 410 (was originally 416), which means it will drop off one of the more accessible bosses instead of H Deathwing. We don't know that for sure. It might not be considered player damage (resilience specifically says it reduces player damage and player pet damage only), and it might be considered phsyical damage that isn't reduced by armor (ie: bleeds). I doubt it is reduced by armor, since every proc trinket I can think of hits for exactly what the tooltip says. Resilience, maybe, but again we don't know for sure. Even if it was reduced by resilience, that's still ~7% of a player's health for doing nothing. See my edit in the first post. Bleeds are PHYSICAL and aren't reduced by armor. You can't say that it is or isn't reduced by armor, because no one has the trinket. All I'm doing is making an educated guess based on how past items like this have worked. Our Feral Druid won it tooltip is modified by damage buffs because it says over 50,000 for him and 39,000 for me. It was doing a lot of damage for him and it crits as well. It currently scales at a rate of +1 damage per attack power, resulting in the proc dealing slightly more than 47,5k damage for me as a rogue in BIS gear. So it definitely scales like mad. The newest patch 4.3.2 brought a much needed change to this item. Just won this on my Hunter tonight from our Heroic Ultraxion kill. Someone add him to the drop list. Saw a rogue with this, full Cataclysmic gear and the legendary daggers in a BG last night. Afterwards Lightning Strike had done 11% of his overall damage. It's still very impressive! "Your melee and ranged attacks have a chance to trigger an additional attack for XXXX to XXXX physical damage." "Your melee and ranged attacks have a chance to trigger an additional attack for XXXX physical damage." On the left is my screenshot and on the right is the wowhead one. 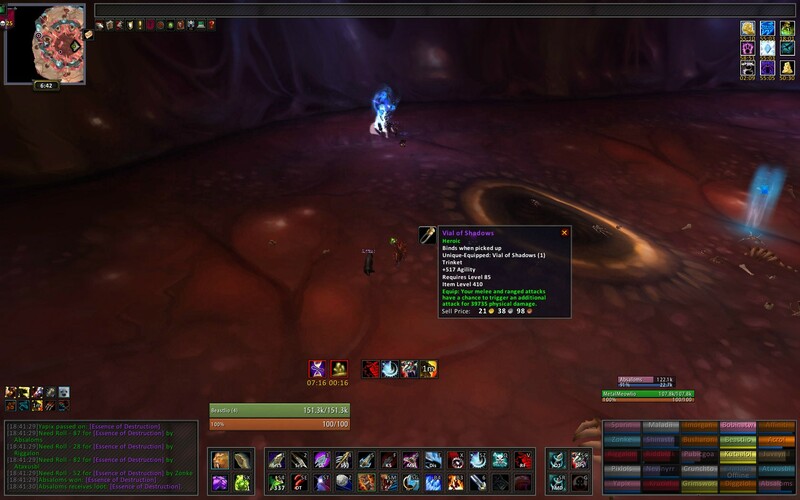 Glad I was able to obtain the Heroic version of the Vial of Shadows after all. I tested this trinket on my guardian in a cata timewalker, it consistently does ~2% total dps with 1.5k max hit. Equip: Your melee and ranged attacks have a chance to trigger an additional attack for (44 + 0.339 * Attack power)-(65 + 0.339 * Attack power) physical damage.